» Back-in parking: Your opinion? A driver tries the new parking layout in front of the Albany Post Office Tuesday. 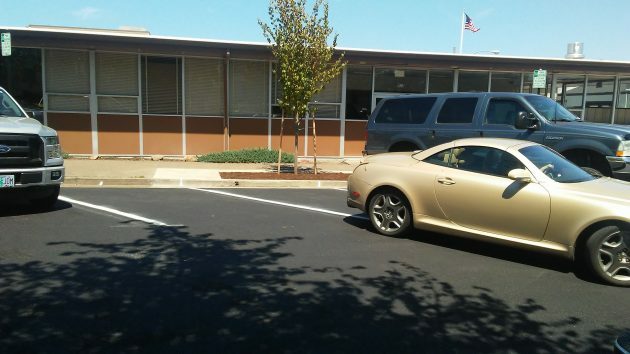 So, if you’ve tried to back into the new parking layout outside the Albany Post Office, how did you like it? There was some initial reaction on social media, and I’d like to hear from people about how this worked for them. The streets around the post office were rebuilt in the first phase of the downtown “streetscape” improvement project supported by CARA, the downtown urban renewal district. Striping for parking spaces on the post office blocks of First and Second avenues and Calapooia Street was laid down last week. On First, the spaces are on the right-hand side of the one-way street and are still blocked by construction fencing at the Albany Carousel. But on Calapooia and Second, the new layout — a first for Albany in modern times — is on the left-hand side and available for use. When I tried parking my compact car on Second in front of the post office after hours on Monday, all but one of the spaces were open and it took me two or three tries to get between two lines. In my truck the next day, it was the same. I found that it’s tough to properly aim the vehicle when you can’t see the lines behind you. And when cars are parked along the curb on the opposite side of the street, there’s not much room to maneuver. City officials insist that according to traffic experts, back-in parking is great from a safety angle. If you have to get stuff out of your trunk, they say, you can do so standing on the sidewalk. And when you get ready to pull out, it’s easier to see that the street is clear of other traffic. 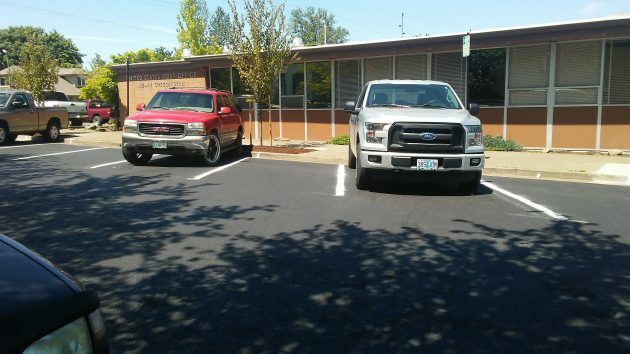 For pickup trucks, the angled spaces are a pretty tight fit. This is the most ignorant parking design I have ever seen. Perhaps a clever way to create complaints to get the Post Office to move? What the city has also done is make parking for the handicapped more difficult. City government at its worst….,,,again. You mention “experts”. Definition of an “expert” is someone with a brief case who is fifty miles from home. My wife and I drove around the post office block a few days ago to take a look. We notice that where the old curb-side drop off box was, it is still a long ‘yellow’ zone. We really hope that they will put the box back now that the roads and sidewalks are almost done. The largest benefit of having the curb side drop off is to reduce pressure on the parking spaces. Without it, folks will need to park just to drop off some letters. The city repainted the new curb yellow because it understands the post office plans to put the drop box back where it was before the street was rebuilt. The postmaster had told me earlier she would first have to review whether this was a safe and good place for the box, given the traffic pattern. Thanks Hasso for publicizing the strange planning being done. I don’t want to back into a narrow parking space even though my car has the back-up view screen. I will bet the backup spaces fill last when people have a choice to park the parallel way. What do younger drivers think? What is the age range of people leaving replies? I’ll mark the over 65 box. Let’s see…………. which is harder, backing into a space that is not moving or backing into traffic which is moving….. I will leave that to you.. but, given the fact that most folks have not tried it we will get pushback on this till folks learn how. I parked yesterday. I found it much easier than parallel parking. Pulling straight out when leaving is also much easier than leaving a parallel parking space. They do back-in parking in China, where I am now living, quite a bit. It seems unnecessarily difficult, and about as good an idea as the traffic circles (roundabouts) which they also have here. It seems obvious to me (but what do I know? I don’t have a degree in engineering or city planning) that backing out of a parking space is far easier than backing into a space. Backing out into moving traffic is NOT difficult…you just need to exercise caution. I expect the extra time it takes to back in to a parking space will make the other motorists impatient. and as a consequence, less cautious. My guess is that people will continue to push back on this until it is changed back, because it is inherently a stupid idea. I wish I could afford to buy a new car capable of parking itself. Unfortunately, I will be forced to do it myself, and learn to put up with Mr. Kellum’s idiocy. You simply have to back up once, either in or out. Whether at the mall or downtown, I always prefer backing in for the same reason Rich cites. It’s really N O T that difficult. If we have a hard time backing in we have no business backing out. Doesn’t look like enough space for people to get out of car. Older people I know open their doors all the way open to get out or into car. At grocery stores we look for end of row to park. I dread the day I have to do this. As should anyone parked next to my chosen spot. Hasso, hang out at the post office during the day and bring your camera. It’s hilarious. Nobody can park in these spots and a LOT of people keep pulling into them front first. They just make this big awkward turn into the space, then even more awkward when they try to leave. “You know the old saying [:] ‘if you can’t back in you can’t back out.’ Think about it.” That is an old saying? I guess I didn’t get the memo. It seems self-evident to me that it is easier to head in when parking and back out when leaving the parking space. If we can’t agree on that, how can we expect to agree about anything? When you have to back out you don’t have two lines you have to stay between which in my mind makes it much easier to back out… It’ll sure be interesting to see the elderly try this or the mom in her big SUV full of kids excited to go the the carousel. Dumb idea City of Albany. Stupid. Dumb. Dangerous. Designers have lost their freaking minds. My husband and I parked there this weekend. We thought it was ridiculous and harder to maneuver into a spot than it should be. Not everyone has a backup camera on their car. I agree with the majority, this will cause more problems then help with the parking at the Post Office. I think they will change it eventually. I can see traffic backing up and drivers getting impatient while folks try to get it right backing into the spaces. If you drive a larger than average vehicle it is a Must to get good at maneuvering into spaces more easily navigated by a compact car and knowing exactly how much space you need, that is, if you intend to actually take it places. For instance, long term parking at the airport. That’s a real challenge. It’s no surprise to me that the big trucks have it perfect while those that are complaining are use to grocery store parking. An expert is : “A has been drip who knows Everything about nothing” . And the city took it all in ….